With my three children poking each other in the back seat, we circled the state capitol for the 3rd time when I finally found a parking spot. “Great,” I muttered, “parallel parking.” Scooter asked why it mattered, being desperate to escape the siblings. “It matters,” I said emphatically, “since I failed my drivers’ test twice because of parallel parking.” It was quite obvious that I was not winning confidence in the backseat, but the poking stopped along with the breathing as I squeezed into a space fit only for some kind of hybrid thingy. Part of the reason I love Montana as much as I do is for the wide open spaces, and when it comes to parking I need wide open spaces. Alas, I gave one last speech as we exited the car about my expectations on behavior. We sat on hard wooden benches in an echoing hallway with a mass of strangers all there for the same thing, even if not there for the same convictions: a raw milk hearing. “Are you a…blogger?” Chris asked me as I stood looking uncomfortable. She said that she recognized my picture from my website (and had been tipped off I’d be there—I’m not quite to RockStar Status of public recognition). She introduced herself as the author of the bill in question. Evidently nervous at what was about to come, she and I both engaged in some small talk which did help the minutes pass until the creaking door opened and security in ugly polyester suit coats ushered us in to the packed and oxygen-less room. The kids shuffled who-was-sitting-next-to-whom upon threat of being separated by me, I started my recorder, and the roll call of representatives on the committee began. My two youngest started drawing with the paper we brought along, and my oldest—not quite nine years old—surprised me entirely by taking notes throughout the two hour hearing. The chairman of the committee asked how many proponents (advocates) of the legislation would speak. The hands in the air were fairly modest, about a quarter of the at-capacity room. How many opponents? Over half of the room raised hands, to include the entire row sitting behind me. It was only later that I discovered that none of these opponents represented themselves as citizens; they were all government employees. The chairman’s facial expression betrayed him at that moment, and he made the request that if someone on the docket came after another who had made the same argument, that they simply state agreement and sit down since “we’ve heard it.” It was clear to me that the number of opponents in the room was somewhat a surprise. 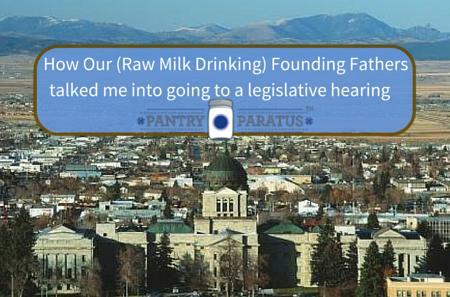 Representative Nancy Ballance stood and spoke for exactly five minutes; she is the official sponsor of the bill (Montana HB245) and she spoke eloquently about raw milk’s health benefits and the death of the milk with pasteurization. After her, several other supportive state representatives spoke. One made the point that 40 states have already legalized it in some form. That farmer talked about how some of his cowshare owners used to drive 5 hours each direction to get to Colorado weekly for fresh milk, and that they were statistically more likely to get into a car accident than to get sick from the raw milk itself. “It seems crazy to me that we are debating the production and consumption of a highly nutritious raw, agricultural product when so many people have been diagnosed with Type 2 diabetes from poor diets. It seems crazy we’re debating the growth and demand of a potentially profitable business for an enterprising farmer when the average age of farmers in Montana is 58 years old and rising. In my mind I thought, “We could end this debate right now!” but alas, no. In fact, there was someone who stood as a proponent to whom I would like to gift a dictionary; methinks she was unclear as to the definition of a “proponent.” Her case was so opposed to the legislation that at the very end of the hearing, the only (I emphasize: the only) opponent who respected the chairman’s wishes to keep brevity by concurring said, “This has never happened to me, but all of my arguments against raw milk were actually made by a proponent!” If eyerolls were audible, the “proponent” with nothing nice say would not have been heard in that room. I debated as to whether I should even tell you about the State Employee Rudeness, but decided immediately that I must with what soon happened. Save the money you would otherwise spend on theater tickets and attend your state’s next legislative hearing on raw milk. Drama aplenty. The first (official) opponent to speak was a representative of the Montana Trial Lawyers. I thought this was informative although ironic. I did not know that trial lawyers sought audience with legislative bodies to mandate laws that would limit personal freedoms from risk-taking behaviors. Just the same, he brought up a few valid points regarding the recourse a sickened consumer would not have available with the current wording of this bill; he poignantly outlined how this would be in violation of the state’s constitution. A well-spoken opponent’s concerns can improve the bill before its passage and I believe his testimony may positively impact this bill as it moves forward through the amendment process. I am not excusing the behavior of those who may have laughed; I did hear that audience-shuffle that often accompanies anecdote given in dramatic intonations, but I did not—from where I was sitting—hear laughter. Just the same, the kind chairman was obliged to reprimand the crowd, and she thanked him profusely at the end for his gesture. If what she had to say was valid, I believe that her tone of voice and mannerisms invalidated some of that information in the minds of the hearers—it was hard to overlook the appeal to showmanship…for me especially, who had suffered through the hearty guffaws from the row behind me just a few minutes prior. The entire hearing took two hours, which was longer than the committee itself had anticipated. The proponents all speak first, and then the opponents with no rebuttal. The final speaker was also the first; the state representative who sponsors the bill spoke one last time. The members of the committee summoned some of the speakers for questioning, and finally all were dismissed. The chances are that purchasing raw milk is legal in your state already in some form; there are just a handful of states (including mine) that do not permit raw milk sales. Anyone in any state may consume milk from their own dairy animal. It’s the selling that is illegal, not the milking of the animal or drinking the milk. If you ever hear of pending legislation in your state on the issue of raw milk—or any other issue that concerns the well-being of your family—I highly recommend you jump into this political process, even if it is only as a silent witness to the unfolding of our republican form of government in action. 2) Holding our elected officials accountable. 8) To be inspired; to be challenged to go beyond your own comfort level in this process. To all of this I might add that in our modern day of emotional appeal, there was some entertainment! I am so glad that I carved out an afternoon for this experience and plan to take a more active part should the opportunity arise for the worthy cause of preserving my God-given freedoms of person and property. I think Thomas Jefferson would be proud. Looking for more information about Raw Milk? Previous post: (Yeehaw, it’s a…) Raw Milk Roundup!